Landscape lighting is truly a science, especially when considering all of the different illumination options, such as fixture design and placement, lighting angles, bulb intensity and lighting colors. Welcome to Epic Lights. We are so pleased that you took a few minutes from your day to stop in. There are lots of companies that can install lights, but only one that will create the perfect atmosphere for your lifestyle. We have created a design and sales process that is unique. It is one that leaves you in charge of your experience. Our philosophy is "since it's your house and your money, you should be in charge!" We will never assume what you desire to see on a nightly basis at your home. We realize that our place is simply to serve you in every way possible so that you have an enjoyable experience. We look forward to spending some time with you and helping bring your imagination to light! Sonoran Lighting Supply serves the wholesale, retail and specification markets. 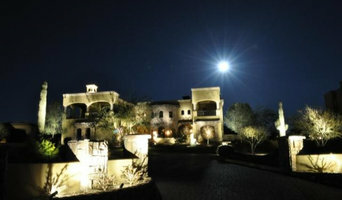 We specialize in outdoor lighting design, sourcing and education and are a one stop shop for your lighting needs. Several years ago, Steve Gold began experimenting with lighting design at his residence (a colonial home built in 1747 for a Revolutionary War general) in Woodbury, Connecticut. In particular, Steve refurbished a number of copper oil lanterns to their original state. What began as a side project turned into an obsession with authenticity. Many a passerby would stop and comment on the lanterns rustic beauty. 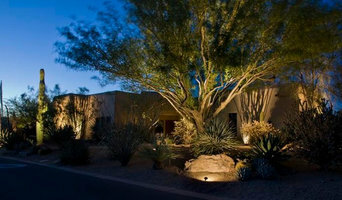 Since moving to Arizona with his wife Patti, Steve took a keen interest in desert landscaping, specifically outdoor lighting. Inspired to make some changes, Steve redesigned the exterior lighting system at his own home. Once again, many people commented on his talent. Steve recognized there was a need in the Northeast Valley for custom lighting, and he felt determined to transform his hobby into a calling. Like his father, Bryan Gold is mechanically inclined and artistically adept. Before moving to Arizona in 2006, he spent eight years as a shop foreman at a Connecticut facility that built race car engines. Using the experience he gained designing, machining and assembling these high performance machines, he decided to enter a new field. Landscape Lighting offered him the opportunity to utilize his mechanical skills, while cultivating his artistic aptitude. He was thrilled to venture on this endeavor with his father. The two began their quest at Nightscaping University in Redlands, California. One month later, Bryan and Steve were licensed, bonded and insured to design and install low-voltage lighting systems. Specialize in custom high quality landscape lighting. Using LED bulbs with a wide variety of beam spreads we help bring a property alive at night. Our expertise creates a unique artistic and functional lighting solution for our customers. We consult, design and have installers for outdoor lighting and audio solutions. We offer free consultations and demos for outr clients. Here at Visual Audio we go by a simple concept of treating each installation equally. Whether a simple troubleshoot or complex system integration/design, Visual Audio will provide a professional quality installation with the assurance and confidence that each install will be done correctly each and every time. Customers will learn from Visual Audio’s knowledge and knowhow on how to operate their system with the confidence of a professional. Visual Audio is your resource for all your home audio/video needs. North Star Outdoor Lighting LLC understands that the visual appearance of a property in the evening must be at its best. By the use of high quality products and our knowledgeable staff, our clients are ensured that their property has the most appealing lighting available. Our experienced staff designs superior outdoor landscape lighting for Home Owner Associations, Apartment Communities, Shopping Centers, Private Homes, and more! Great service, quality, and value is our promise to you. We have outstanding references and our accredited licenses. Whether it's improving on existing landscape lighting, or starting a brand new outdoor lighting design, we have the tools and the knowledge to provide the results you would expect from a reputable company. Let us offer you a competitive estimate on your next outdoor lighting project. Spirit Lighting is focused on you. Whether you’re a commercial or residential client, we’ll create a holiday or year-round lighting display that fits your needs and budget. We want to make your business shine and increase street presence, drawing customers in and giving you the oportunity to grow your sales. For residential clients, Spirit Lighting wants to give you a hassle-free holiday season with a professionally designed and installed holiday lighting and decor display. Don’t spend a weekend up on the ladder and rooftop – that’s our job! Why Spirit Lighting? Because we are... - focused on providing you with the best and friendliest service possible - business-minded individuals who strive to understand the needs of your business - making the entire decorating process hassle-free - direct importers of holiday lighting and can beat our competitors' pricing - confident that we can save you at least 10% on your previous holiday program - committed to LED lighting which saves you up to 90% on your holiday energy bill - able to sell or lease holiday lights and decor depending on your needs - a manufacturer of custom holiday decor such as lighted wireframe designs - able to tackle any sized job -- from a single house to entire city blocks! In the technology world we do it all! Leverage Technology Group provides a wide variety of services for commercial and residential applications. For corporate environments we supply projects within the small business, government, education, house of worship, retail, medical, and entertainment channels. We supply wireless data networks, audio/video conferencing, video walls, video signage, security/surveillance systems, video projection systems, phone and telecom systems, smart boards, distributed music systems, wireless audio, automation, computer repair and virus determination, programming, troubleshooting, lighting control, professional installation and a great deal of after the sale service! For the private individual we provide all of the above plus home theaters, surround sound, the latest in 4K TV's, all-in-one system remotes, and a wide variety of other specialized solutions. Our projects range from small to large and we retain clients in all the Phoenix and surrounding communities, Arizona and surrounding states. We stand on our expertise and long-term service and our goal is to become our clients "technology partner" for many years and this is the prime reason we continually get referral business from our happy clients! Leverage Technology Group is a Minority Woman Owned Scottsdale-based Technology Company that has been in business for over Twenty-Five (25) years. We take pride in the fact that we offer unsurpassed customer service and support and at competitive pricing structures. This has enabled us to grow to over 1500+ clients in multiple states. We are a direct dealer for products like Apple - Microsoft - Panasonic - Sony - Samsung - LG - SONOS and a wide variety of residential and commercial audio electronics. Let us become your dedicated partners in whatever your technology needs are! We also provide 3D environment designs for the architecture, builder and design communities. ** We offer no charge initial project consultations. Please contact us at our main office of 602-748-4040 to schedule an initial project interview or to schedule system service. Outdoor lighting (permanent or short term) installation, Party Event Rentals and Planning, Holiday Lighting Company with over 12 years of experience. Licensed and Insured. With 14+ years of Real Estate experience to give you the luxury finish you need at your home or event. Established in 1988, Desert Sound & Security has developed a respected reputation for innovative design and quality home control and automation installations. We provide solutions that simplify the technology in our clients lives and make it just plain fun. We install tested and proven products. Our Desert Sound staff is our greatest asset with a intense that focuses on 100% customer satisfaction. SiteHawk utilizes state of the art technology such as purpose-specific cameras, surveillance analytics and perimeter intrusion detection to employ the correct technology for a particular business need significantly improves incident detection while lowering operational costs. 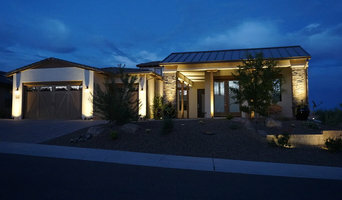 Lighting Unlimited is a family owned Arizona based lighting distributor founded in 1989. Started by founder, Scott Schneider, the company has grown and evolved from a one person sales operation into one of the Valley’s largest lighting distributors. Our mission is to provide an outstanding buying experience to our customers. We have achieved this by offering comprehensive training and development to our employees. As we extend our living spaces to include outdoor rooms, it seems natural to want outdoor audio and visual systems. Sound system professionals in Fountain Hills, AZ can install state-of-the-art wireless weather-resistant music systems anywhere you want to add music to the mix. What services do Fountain Hills outdoor audio and visual system professionals provide? For the most part, people hire outdoor entertainment system providers for backyard installations. After all, pool parties and barbecues are much more fun when there is music to enjoy. How do they do it? Your Arizona outdoor custom audio system technician can work with your landscape designer or architect to install weather-resistant outdoor speakers, discreetly buried into your landscaping with no loss of sound. Here are some related professionals and vendors to complement the work of outdoor lighting & audio/visual systems: Landscape Architects & Landscape Designers, Landscape Contractors, Decks, Patios & Outdoor Enclosures, Siding & Exteriors. Home theaters are moving outdoors, too. Sports fans can grill without missing the game, and families can invite neighborhood friends over for movie nights. Special weatherized flat-screen TVs are coated to minimize glare. Imagine your Fountain Hills, AZ backyard with a custom-designed outdoor theater system — complete with a large projection screen. It makes backyard entertaining easy. Find outdoor audio and visual system professionals on Houzz. Look in Houzz’s Professionals section to find Fountain Hills, AZ outdoor audio and visual system experts. Narrow your search to the nearest city or metro area for a list of nearby businesses. Get contact information, read reviews and look at completed Arizona custom outdoor sound system projects.